Click the chart for more info on Netflix shares. NEW YORK (CNNMoney) -- Netflix shares plunged 25% Wednesday, a day after the company reported better-than-expected earnings but issued a weak outlook for the rest of the year. Netflix said it may be "challenging" for it to meet its goal of adding 7 million new streaming subscribers in the United States this year if subscribers don't come in strong in the third quarter. In the first half of the year, Netflix added roughly 2.3 million new domestic streaming subscribers, and now has nearly 24 million in total. In a letter to investors outlining the results, Netflix CEO Reed Hastings suggested that the Olympics could have a negative impact on viewing and sign-ups. Netflix (NFLX) reported $889 million in revenue for the second quarter, in line with analyst expectations, and earnings of 11 cents a share, ahead of analyst projections for five cents. Net income was $6 million. In the third quarter, Netflix said it expects to post results anywhere between a loss of 10 cents a share and earnings of 14 cents a share. For the fourth quarter, the company said it will return to the red as it launches in a new market -- as yet unnamed -- in Europe. Netflix had warned previously that it would lose money throughout 2012 as it expands internationally. In the first quarter, the company lost $5 million, or 8 cents a share. Netflix's stock has been volatile this year, pushing close to $130 in February before dipping to around $62 in June. Shares jumped more than 10% earlier this month after Hastings revealed that subscribers watched more than 1 billion hours of video in June. The stock tumbled 13% in after-hours trading Tuesday, and continued selling off sharply into Wednesday's trading session. Shares were down 22% at $62.52 mid-morning. A key concern for Netflix is how much it will have to shell out to retain its catalog of TV and film titles. Studios are demanding that Netflix pay them more money for their content, and not all of those negotiations are working out. Netflix was unable to renew its contract with Starz, a key content supplier. The Liberty Media (LMCA)-owned cable company has a large chunk of Disney (DIS, Fortune 500) movies that are now no longer in Netflix's catalog. The company is also facing competition in streaming from HuluPlus and Amazon Prime Instant Video. Hastings said neither of these services have so far gained "meaningful traction relative to our viewing hours," but are likely to step up their efforts. Verizon's (VZ, Fortune 500) Redbox Instant, set to launch later this year, will offer an additional challenge, though Hastings said it "will face a big challenge to break into the top 3 of subscription streaming services." Terrible 2011: Netflix was once the company that could do no wrong in the eyes of customers and investors. 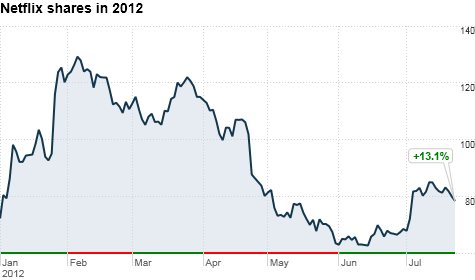 But 2011 was a year full of missteps that eroded both Netflix's reputation and market value. The troubles began in September, when Netflix hiked prices by 60% for customers subscribing to both Netflix's DVD and streaming business. In the third quarter of 2011, the company's U.S. subscriber base fell for the first time in years. Then, Netflix stunned customers when it said it would rename its DVD business Qwikster and separate that business from the more lucrative streaming division. Customers raged so much that Netflix scrapped the idea less than a month later. In Tuesday's letter to investors, Hastings said the company guessed it would take three years from the Qwikster debacle before Netflix achieves "full brand recovery."